I came here, hoping someone figured out how to combine this with Auctionmaster Beardo to get a huge weapon, but even then you'd have to actually be able to pay 2 mana each time plus whatever the spells cost. Even with double counterfeit coins and one real coin, you'd only be able to activate this thing three times on turn 10 (Beardo is 3 mana, this is 4. 1 hero power. 1 coin = 2 HP. 2 coins yields one more HP). 5 card combo for a 4/3 weapon on turn 10. I've no idea what they were thinking about this card. How am I supposed to get any value of it? If you compare it without any buffs. Poisoned Blade 4 mana 1/3 vs N'Zoth's First Mate 1 mana 1/3 + 1/1 minion. How can this card even be epic, to give DE value? Using your hero power doesn't make it any better… A 6 mana 2/3 really? Assassin's Blade got way better stats, and nobody plays it because it's too slow. I think their intention was to give rogue a way to trigger inspire effects without destroying the weapon from their hero power every turn. On paper this card seems okay if it was cheaper, but their execution of it was poor. There are minions that can do that for you, Fencing Coach like "the next time you use hero power it costs 2 less". As rogue you can take it back drop it again? Or Maiden of the Lake but its a 4 mana pffshh. Slightly better since you get a body on the board as well as buff. otherwise this thing is useless! Rogue has better weapons at their mana cost that are better than wasting turns on this. This card is awesome: Turn 1 coinCutpurse prep Burgle get Windfury, then prep and windfury on Cutpurse. Turn 2 attack twice then coin coin Poisoned Blade now you have a 1/3 weap turn 2 that will only get stronger. Always works for me. The worst card in the game, even Wisp is better. Tentacles for Arms is similar to 2 attack hero power. but need to invest 5 mana initially. Thing is the hero power doesn't damage you, and tentacles still costs more in the long run. You can use it twice for each play, giving it a cost of 2.5 mana per attack.That sounds subpar. Worst card in the Grand Tournament Expansion. Hopefully Rogue will get a better weapon in the next expansion. I've been trying with Finley, but it just doesnt help. Rogue really just didn't get enough from TGT. 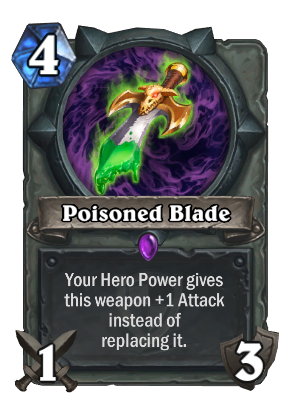 I feel like if Blizzard would take the blade's text and make that the hero power up from Justicar Trueheart I would feel differently. rogue have poison and oil can buff weapon quickly. A poison to this weapon will be 9 damage in total as compare to normal 6 damage. if this is 2 mana sure see plays. If using your Hero power gave it +1/+1 instead, it would become interesting for control style decks - high risk (Acidic Swamp Ooze, Harrison Jones), potential high reward. As it is it just doesn't compare favourably to Assassin's Blade. They should give this to Paladin and make it common so it fucks up Pally arena. I'd consider it if it were 2 mana (Like most people already said) or at least a 2/4.